Paint colors are one of the easiest things that real estate investors can use to dramatically improve the value and look of an investment. Many Phoenix real estate investors can find the large array of color choices intimating and do not want to choose a color that they think that home buyers will hate. 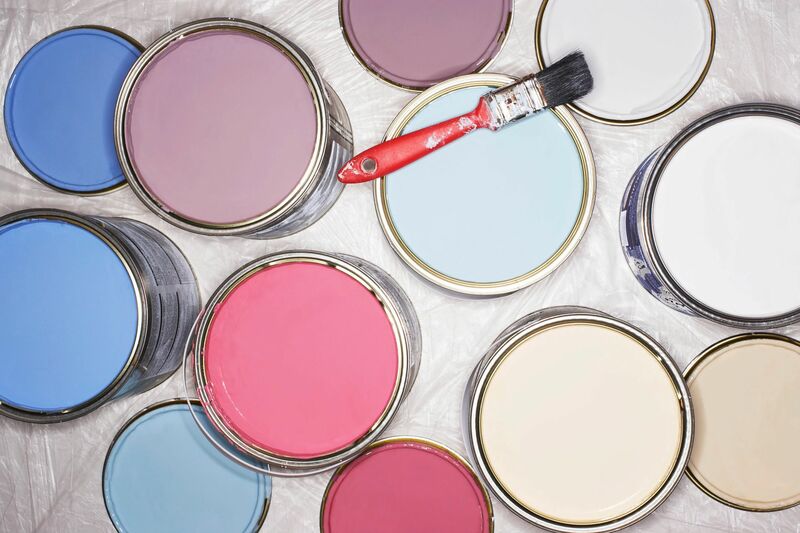 Our handy guide will help you walk through paint colors, and know how to add value to a room with your choice, and when to avoid colors that will lose you money! What colors work best in each room? Did you know that color is one of the top 7 theories of interior design? There’s no denying that color can drastically change the mood and the tone of a room quickly. One of the easiest rules of color theory to follow the rule of light. Dark Colors will make your room look smaller, while light colors will make your room look larger. Using this theory, Phoenix real estate investors can use this to play up features of their flip. A large spacious bedroom can be a huge selling point to buyers, so choosing a light airy color will highlight this important factor in a listing. A smaller front room can easily be transformed into a calming office, and darker colors will make focusing easier as they will be less likely to be distracted. You may remember the color wheel, You have your primary colors (red blue yellow) and your secondary colors (green, orange and purple). These colors are divided by falling into either warm or cool color palettes. For Phoenix real estate investors, using a mix of cool, warm, color choices will help you enhance each room beautifully. You can find a great color wheel to use for your flip here. It’s no surprise that gray has taken kitchens by storm. A cool shade, but still inviting and natural. Gray looks beautiful in kitchens because not only does it bring a calming sense to the room, it also is easy to accentuate, and accessorize. While gray is a trendy color for space, it may not work with every space, if a room has poor lighting you may want something that really brightens a room. Some Other great colors to consider for a kitchen are, blue, yellow, and maybe red. Each of these shades will add something different to a room, but the end goal for a kitchen color should be to create a unifying, warm and welcoming space. Another room Phoenix real estate investors should use cool colors with is bedrooms. Deep shades of blue can add a classic elegance to a room, and work beautifully with time-stamped pieces. For smaller bedrooms, pale blue, and muted pastels can bring a whimsical and romantic touch to a room. These light shades will still bring an inviting and comfortable environment They can be easily matched with lighting or dark floors, and adding soft touches, such as sheer curtains will complete the look. Bathrooms can be revitalized with a new set of colors. While white is always a classic choice, neutral tones, and earth colors can be a beautiful accent to tile and countertops. Neutral colors, such as tan, light browns, and warm shades of white will pull the room together. Blue shades are a great choice as well, but as long as it is properly accented. Phoenix real estate investors love making a living room stand out. They can do this with many shades! Some prefer warmer colors, such as red, which is great for brick, or even as an accent wall. Yellow and Orange are safe choices for those who want warm family rooms. Green can be cohesive and sophisticated, while Purple oozes luxury. If you have an open floor plan, be sure to look at how your living room color will look net to nearby rooms, and make sure to pick colors that do not clash. Once you have beautiful colors in your flip, Phoenix real estate investors add color accents throughout rooms. Your hours should have a clean and uniform trim throughout, so eggshell white is a great option. Crown molding is always a beautiful accessory to rooms and help transition wall to ceiling. Countertops play a huge role in how a room looks, so be sure that it doesn’t match your color too closely, but is complimentary. A good rule to follow is that you want to compliment colors, not match them. Home Rehab loans are a great solution for Phoenix real estate investors who are looking to upgrade their real estate investment properties. Home rehab loans are a type of hard money loan, that is credit based, so it is easy to apply and be funded in a matter of days. Phoenix real estate investors use hard money loans because they are asset-based loans. The property value, and after repair value is used to secure the loan, so no credit history is required. Learn more about our Home Rehab Loans here.